June 12th was the grand opening of the 11th China Int’l Machine Tool and Tools Exhibition (CIMES) in Beijing China Int’l Exhibition Center, whose co-hosts were China National Machinery Industry Corp. (Sinomach) and China National Machine Tool Corp. (CNMTC). The former Minister of Ministry of Machinery Industry, Mr. Bao Xuding, the Vice Chairman of China Machinery Industry Federation (CMIF), Mr. Zhang Kelin and their Special Adviser, Mr. Jia Chengbin, Vice President of Sinomach, Mr. Xie Biao and so on attended the Opening Ceremony. 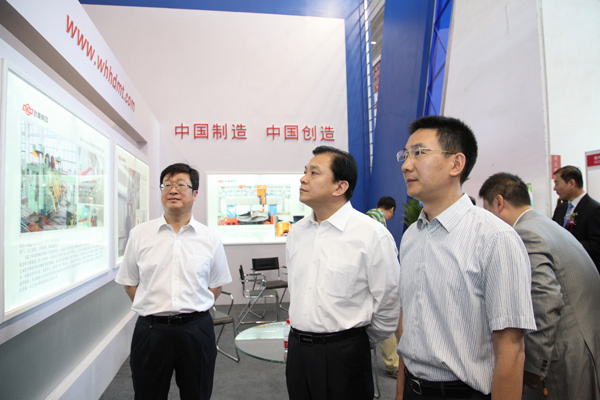 President Ji Xucheng, as one of the enterprises leaders attended together and accompanied the Mr. Bao Xuding and Vice President Xie Biao to visit the Exhibition.